I didn’t have this project on the blog in 2008, I copied it from the old CMS in 2015. A computer keyboard can be a very personal utensil. 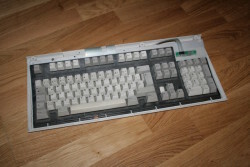 Especially if it is an extraordinary well built one, like for example the IBM Model M. The Model M design dates back to 1984, but it still has many fans even nowadays. 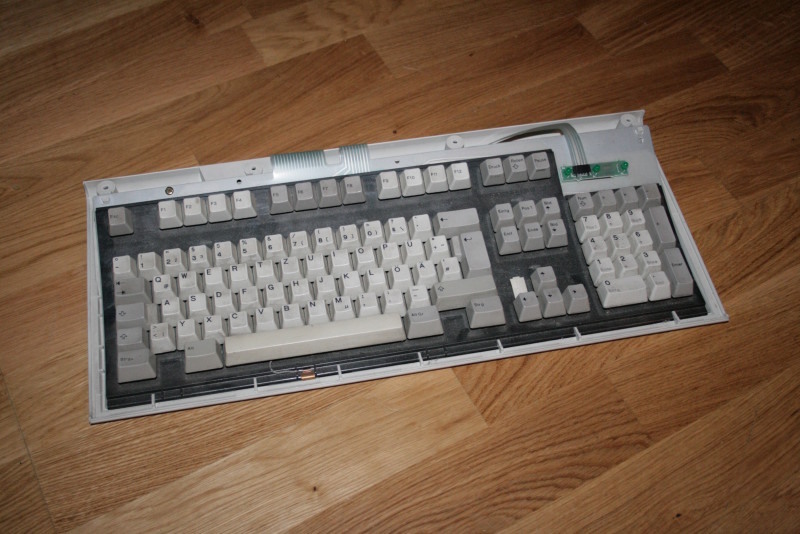 It came with the usual keyboard connectors. First the old 5-pin one, later a PS/2 plug. Unfortunately is that, at least to my knowledge, they never released a version with USB. The main part of a computer keyboard circuit is the key matrix. You can imagine it as a number of keys, placed on a raster of horizontal (rows) and vertical (columns) wires. 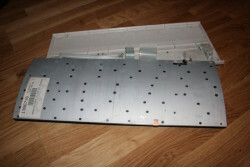 In the case of a Model M keyboard, we have a matrix of 8×16 lines. Eight columns in 16 rows, or the other way around, depending on how you look at it. Each key is connected to one column and one row. If you press the key, it will connect the column and the row on it’s crossing of the lines. Connected to this matrix is a keyboard controller. 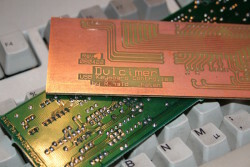 That’s a chip with a number of I/O-lines to detect the state of the matrix, and on the other side an interface that enables it to talk to the computer. 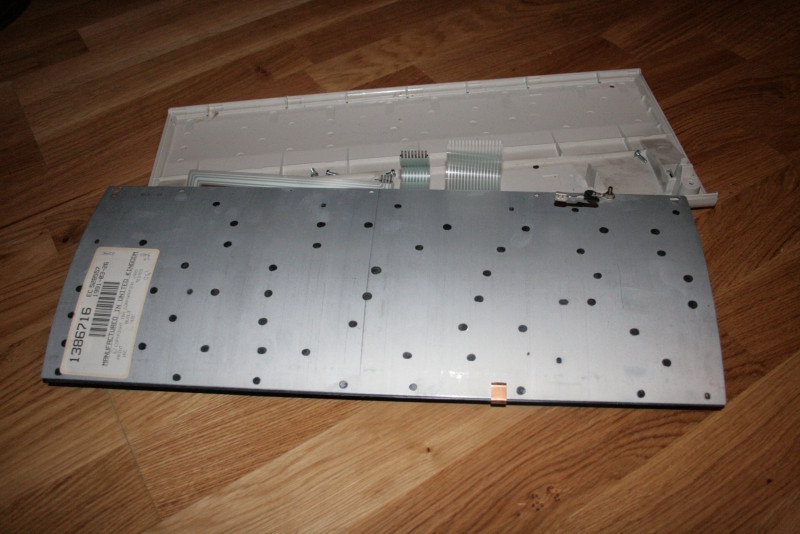 Oh, and not to forget: it also has three output lines to drive the LEDs for Num-, Caps- and Scroll-lock. What I did in this project is, that I dumped the keyboard controller chip and its circuit, and replaced it by an ATmega32 and my own circuit. 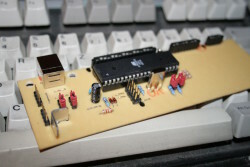 The ATmega scans the matrix for keyboard activity, controls the LEDs and talks to the computer. For further convenience, I added a boot-loader. With that, it is possible to update the keyboard’s firmware without disassembling it, and without the need for a dedicated programmer. As mentioned, the controller in this project is just connected to an ordinary keyboard matrix. 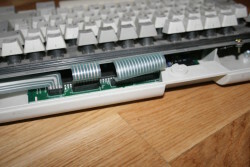 You can find this kind of matrix in all kinds of keyboards, from key-telephones over good old hardware like the Commodore C=64 or the Schneider CPC, keyboards with non-PC-connectors like those made by Sun, to modern hardware that could need a few more features. 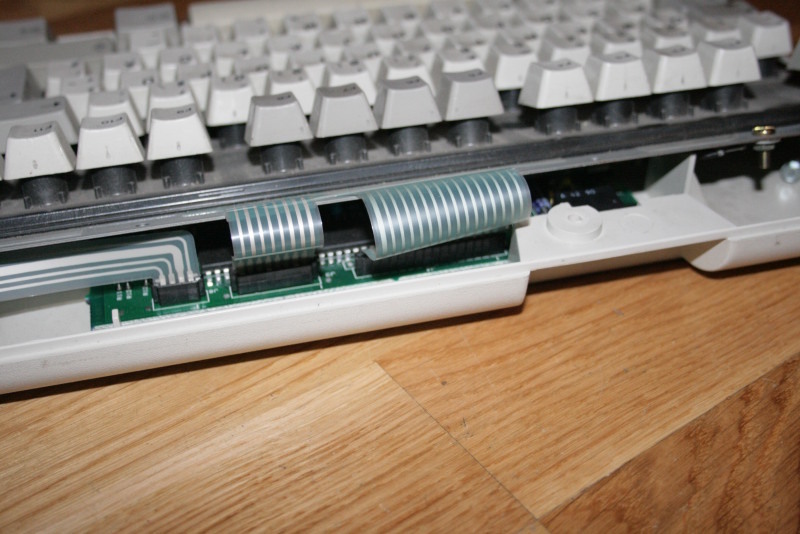 Till now, I just made a PCB layout for the IBM Model M, but I intend to modify at least a Sun keyboard. In order to do that, I expect having to refactor the key-scanning, since the key-matrix is not 16×8. The positions of the keys on the matrix will be different, I’ll have to re-engineer that. And of course, I’ll have to make another PCB. use arrow keys as mouse, without having to include a special driver in the OS. If you are just a little like me, it won’t take you much brainstorming to come up with own useful — or even better: useless — ideas. Connect the keyboard to the USB-port. All LED should flash up to indicate that the device is initialized. Then you can use the keyboard as always. If additional features get implemented, you will be able to use them in their respective ways. I don’t know if and how keyboard manufacturers face the problem of ghost keys, I didn’t take special measurements for this. I hope that the engineers at IBM distributed the keys on the matrix in a way that minimizes this problem. Don’t misunderstand: I haven’t experienced that on this keyboard, but I know that it’s a common problem on key-matrixes. I took great inspiration from Spaceman Spiff’s c64key, this software is based on his ideas. Further credits go to xleave, who etched the PCB for me, and also answered many stupid questions about electronics I had during the last few years. And of course I’d like to thank FaUl of the Chaostreff Dortmund who gave me the idea for this project.